DxO Optics Pro software automatically improves image quality by taking into account the precise characteristics of your photographic equipment (camera body and lenses). Designed for serious amateurs as well as forprofessional photographers who are looking for the best image quality possible, DxO Optics Pro processes both JPEG and RAW image files. Recognized around the world for its award-winning automatic optical corrections, DxO Optics Pro handles every kind of problem that can affect image quality. 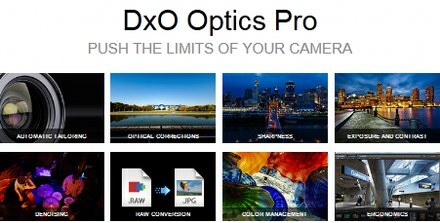 Whether you want to use its image processing capabilities to automatically improve hundreds of images through batch processing, or if you prefer to manually define the processing settings for each photo, DxO Optics Pro perfectly adapts to your needs to give you unsurpassed image quality and incomparable productivity. DxO ViewPoint is the first software solution entirely dedicated to correcting distorted elements on the edges of your photos, and to fixing problems with keystoning and tilted horizons. Thanks to the precision and simplicity of DxO ViewPoint s tools, you can quickly and easily restore the natural proportions of the subjects in your images by integrating the power of DxO Labs exclusive geometric correction technology into your usual image processing workflow.